Hi guys! It's been long that I don't have entry in this blog. It's because, we're always going out and just eat in the resto. But tonight, I was thinking to cook something because i really miss it. And the weather is so nice and we eat outside in our patio. The photo is originally taken by me but this recipe is courtesy of Giada De Laurentiis that i took from the foodnetwork.com. *Preheat the oven to 375 degrees F.
*In a small bowl combine the thyme, parsley, garlic, fennel seeds, red pepper flakes, and a pinch of salt and pepper. Stir to combine. Place the chicken pieces on a work surface. Gently loosen the skin of the chicken and push the herb mixture under the skin. Season the chicken all over with salt and pepper. *Warm the olive oil in a large skillet over medium-high heat. Place the chicken in the pan, skin side down, when the oil is hot. Cook until the skin is crispy and golden, about 5 minutes. Turn the chicken and cook the same way on the other side. Turn the heat off the pan and reserve. Transfer the chicken to a baking dish, skin side up again, and finish cooking in the oven, about 15 minutes. *Meanwhile return the same pan to medium heat. Add 1 tablespoon of the butter. When the butter has melted add the cipollini onions and carrots. Sprinkle with salt and pepper. Cook until tender and golden in places, about 7 minutes. Add the chicken broth and scrape any brown bits off the bottom of the pan with a wooden spoon. Add the snap peas and mushrooms. Simmer over low heat until the vegetables are tender and the liquid has reduced by half, about 5 minutes. Season with salt and pepper, if necessary. *Remove the chicken from the oven. 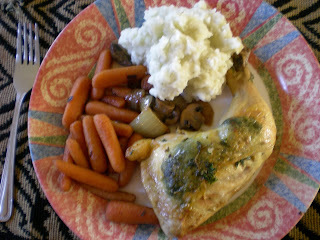 Spoon the vegetables onto a serving platter along with the chicken. Spoon the sauce over the chicken. Serve immediately. Hi there, would you like to exchange links?